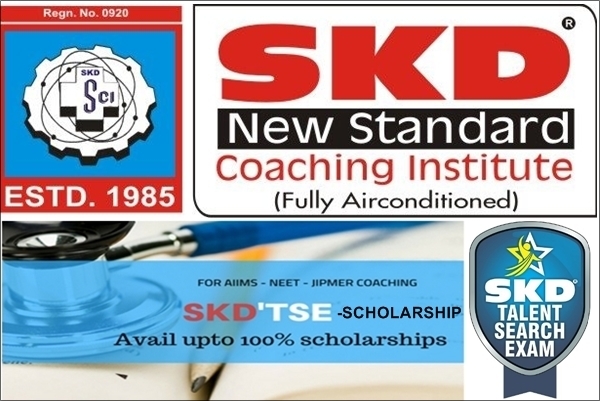 SKD New Standard Coaching institute, Lucknow offers SKD TSE Talent Search Scholarship Exam for the most deserving students to achieve their goals by providing them with affordable coaching and to give them this once-in-a-lifetime opportunity of attractive prizes, scholarships mentorship. SKD New Standard Coaching institute for Class X, XI, XII studying students with sole objective of becoming a pioneer educational career guidance group by enabling the bright students of the country to achieve what they deserve to. The students joining 1-year course shall be eligible for Scholarship for 1 year only. However, those students who join our 2-year program shall be eligible for continued scholarship for the entire period of 2 years subject to Terms and Conditions. Scholarship discount in tuition fee only. Step 1 : Visit the official website provided above and read the instructions carefully. Step 1 : For Offline Registration download the application form from the official website. Step 2 : For All Offline Registrations Payments can be deposited by Cash. Step 3 : Please Send us a Query /Call us/Contact Institute to fill the application form. Kindly fill the enclosed SKD'TSE Registration Form and submit along with your self-attested photocopy of class X, XI, XII mark-sheet (as applicable), 4 passport size color photographs and cash of 200/- in favor of ‘Skd Academy Institute’.In case mark-sheet is not available, students can enroll by submitting a self attested photocopy of their Identity Card issued by the school. Online Registration Facility is available on website: www.skdnsci.com. For All Offline Registrations Payments can be deposited by Cash. Please Send a Query /Call /Contact Institute.